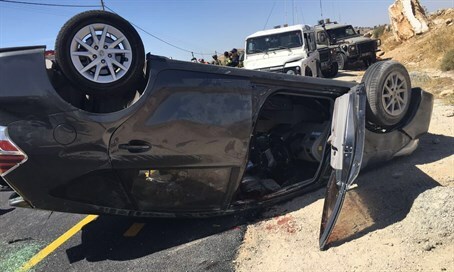 Arab terrorists overtake family traveling in their car and open fire, killing Michael Marc of Otniel, wounding three other family members. One person was killed and three others wounded in a shooting attack at the Adorayim Junction south of Hevron in Judea. The fatality has been identified as 40-year-old Michael "Micki" Mark rom the nearby town of Otniel, who was traveling in his car with his family when it was targeted. His wife Chavi was seriously wounded in the attack, and was evacuated to Jerusalem's Hadassah Ein Kerem hospital with multiple gunshot wounds to her upper body. Two other family members were also wounded in the attack. Paramedics say in addition to the mother of the family, they treated a 13-year-old girl in moderate-to-serious condition suffering from gunshot wounds to her upper body, and a 15-year-old boy who was lightly wounded, presumably from the crash. According to initial reports, a "Kia" model car overtook the family as they drove along Route 60 and opened fire, striking both parents and causing the car to overturn. As many as 20 shots were fired at the car, investigators say. The victims are a well-known family from the area, who live close to another family from Otniel struck by a deadly terrorist attack during the latest wave of Arab terror. IDF forces responded quickly and are currently pursuing the terrorists who carried out the attack. The attack bears a chilling resemblance to the drive-by shooting which targeted another Jewish family in the same area in November last year. Rabbi Yaakov Litman and his son Netanel were murdered in that attack, as they were traveling with their family. Thhat deadly attack also took place on a Friday, not long before Shabbat. The latest attack comes just hours after an attempted stabbing at the Tomb of the Patriarchs in nearby Hevron. In that incident, a female Arab terrorist was shot dead when she drew a knife and attempted to stab Israeli soldiers guarding the holy site. There were no Israeli casualties in that incident. Yesterday (Thursday), a 13-year-old Israeli girl was murdered as she slept in her bed in the town of Kiryat Arba, by an Arab terrorist armed with a knife. The terrorist also wounded a member of the town's security team responding to the attack before other security team members shot him dead. As the funeral of young Hallel-Yaffa Ariel took place, further north in Netanya a second Arab terrorist struck, wounding two civilians at a local market before being shot dead.